2014 is swiftly drawing to a close. In the midst of making sure my shelves will weather the upcoming Christmas season, I’ll be placing my final orders for the last dribs and drabs of product that will grace the new comic book shelves through to the end of this year. Most of the year’s events have drawn to a close, save Spider-Verse and Axis which sees Marvel through this quarter of the year. Two weeks ago, I made the mistake of thinking that I would have time to relax before having to stress about the next incoming ordering monstrosity. I should really know better at this point. Oh, honeycomb, won’t you be my baby, well, honeycomb, be my own. 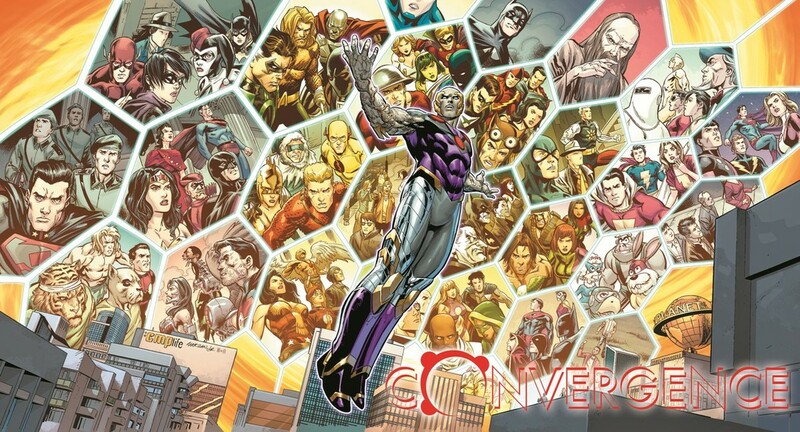 Acknowledging that moving cross country and restaffing an editorial department might be distracting for its staff, DC officially announced it’s two month fill-in event today, CONVERGENCE. The event will replace the New 52 line-up for two months, April and May of 2015, with a framing 9-issue mini-series, starting with a zero issue, and spinning into 40 two part mini series. –-from The Beat’s coverage of Convergence. Which is to say, at some point over the past year, DC decided to marry the twin hells of ordering weekly comics and scuttling their entire regularly scheduled ongoings for a month or two in a bid to drive me to an early grave. Or they took a look at what their production schedule would look like with an upcoming move across country and thought they might want to alleviate the stress on their staff. I honestly prefer the version where it’s somehow all about me, because I write diatribes on the internet and I am very hard done by. Elsewhere, Marvel had been releasing several teaser images displaying interesting takes on previously ran stories, all with the promise of something big in the summer of 2015. As we found out on Friday, this was all in service of their upcoming return to Secret Wars. While details are still pretty vague on the Marvel front, they seem to be pushing an angle that would see their line drastically altered while all of this plays out, promising sweeping crossovers not only in their comic book line, but various forms of other media. What this means has yet to be seen, but in my nightmares, I picture a world burning as I try to punch in numbers for several reality-shifted titles for several months. Admittedly, these are early days, and what we know about both events amounts to very little. While DC has been very specific about formats, they’re playing fast and loose with concepts. Marvel, on the other hand, has provided a bunch of concepts, but no shape or format. Attempting to parse a plan of attack for either at this point would be something akin to a group of blind men trying to figure out what an elephant looks like, so I’m not going to do that. Instead, I’m going to go over some best case scenarios and build the shape that I’d like the events to take from a retail standpoint over the span of two articles (because you guys – there’s a lot to talk about). Some of this might be a little dry (and ultimately pointless in the face of decisions that have already been made), but providing a guide to what retailers are looking for in events such as these can’t hurt. Of the two, Convergence is being built as a necessity, more than something extravagant. 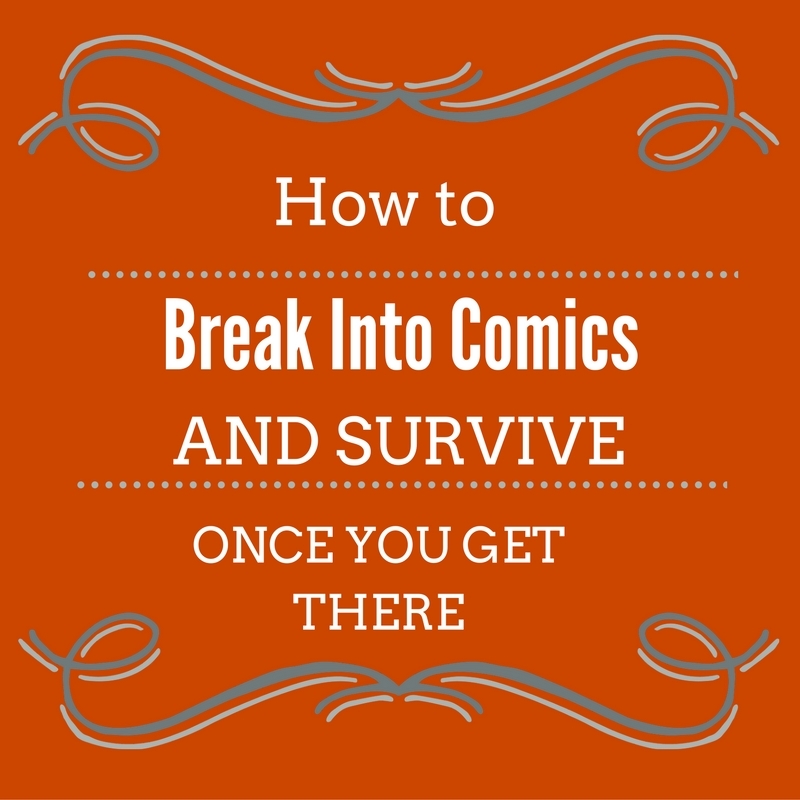 Even if the concept was born out of creative decisions, the execution is all business, marrying the need for DC to pump out enough books to fill out their budgets while simultaneously alleviating editorial and creative pressures during the big move. As such, it’s already on the back foot, appearing as though it’s a fill-in event, something that is decidedly not their main line of books in any way, shape or form. If they don’t tackle this perception in the marketing, April and May might be a couple of DC’s worst months as many opt out of the two months of content. One of the things the company should have done right off the bat, is get a name to help out with the main series. While I’m sure the new-to-comics writer Jeff King is a remarkable talent, if I walk up to my customers and tell them who is operating at the core of this event, I will inevitably be met with a “who?” from most parties. The inclusion of Dan Jurgens and Scott Lobdell as event consultants does offer a bit of name recognition, but not the kind that’s going to sell books. Again, talented as they may be, I haven’t been able to get those writers to move the dial up on any books that I’m selling, and when you are building two months worth of content, you need to be able to attach an element of interest to the creative, even if the creator in question is only consulting and helps bang out plot points. An illustration of this point can be found in the sales of DC’s three weekly titles. 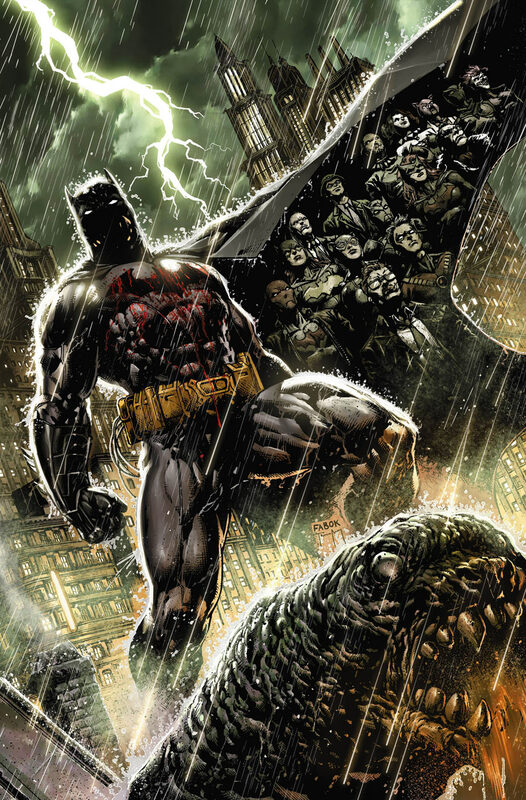 Batman: Eternal is scripted by a rotating team of solid writers with superstar Batman writer Scott Snyder providing some plot work, sharing the workload with James Tynion IV. That book sells like gangbusters. Meanwhile, New 52: Future’s End launched with a free first issue, and a cracker jack creative team attached, but nobody who pushes into the stratosphere. The weekly Earth Two book is operating under similar conditions, and was sold as a sister title to the main Earth Two book. There is almost no reason for someone who isn’t already following Earth Two to follow the weekly, and my sales are definitely reflecting that. Had their been a more recognizable writer at the core, and had the marketing been something a bit deeper than do you like Earth Two, things would be quite different. Jeff King should be paired with someone like… say, Warren Ellis. Or Grant Morrison. Or – dipping into the impossible for a second – Alan Moore. If this event has really been long in the planning, hiring a “get” to even just sit quietly in the corner of one or two Skype meetings in order to give more of a push would do wonders for the core – and if the core is strong, the books spinning outward will be all the better for it. Going out from there, the announced slate of 40 two-part minis can and should be entirely self sustaining. DC should take great pains to let people know that there is zero knowledge required to check out both the main Convergence series and the minis that surround it. That’s how I’m going to sell things. While I know that Convergence is spinning out from the events of Superman: Doomed, Future’s End and Earth Two: World’s End, I’d never place that baggage on the event, unless it is earned. If DC puts out a product that pulls to heavily on prior knowledge, I might as well gather up almost every copy I’ve ordered of Convergence and set fire to it to keep warm. Nobody likes feeling like they don’t know what’s going on, and while it’s easy to wave a hand dismissively and say “they can catch up”, that’s a sure fire way to nab some pretty anemic sales. With so many entertainment options out there, both within the industry and without, “complication” is not a selling point, it’s a reason to jump ship. The less connective tissue the better. As for the content of the two-part minis, DC should definitely be using the two months as an opportunity to truly get creative. If I had my druthers, about 25% of the books would feature regular creative teams being let loose. Let folks like Scott Snyder and Brian Azzarello and Jeff Lemire and Gail Simone loose on your multiverse with a license to say or do anything. The other books? Run completely wild with surprising concepts and creators. Run it like Marvel’s recent Edge of Spider-Verse mini-series, handing out a framework and stepping back to see what unfurls. Becky Cloonan, Brandon Fletcher and Camerson Stewart have already proven they can spark some interest, let them all punch through two issues of something unique. Dig around near and far, and grab from all walks. Would Los Bros Hernadez be interested in something? 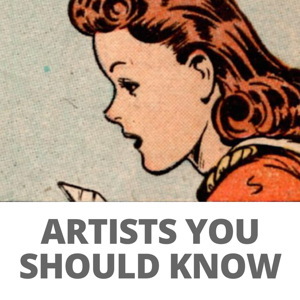 How about folks like Rick Spears or Ales Kot? What about Bryan Lee O’Malley? Turn off the house style, and really make the month interesting. Get new readers coming to your line, instead of producing the same old, same old. Business as usual combined with a glorified fill-in event will only lead to disinterest, and I can guarantee the company isn’t expecting much from this line of books, so my not take a few massive risks? Who in their right mind would blame you given the fact that you’re moving across country while it’s happening? Now, launching out from there, regardless of what the company attempts in the two months, the line should look quite different. Keep what’s been working, and otherwise, shake up the line. If this is done in tandem with an interest line-up of books during Convergance, the company will be able to drum up some vague interest, and capitalize on it completely when they double down and per some of the strange infiltrate their line. Whatever happens, I can guarantee sales will give a fairly accurate representation for the amount of hustle the company is putting into producing the line. It will all be about perception, as retailers are going to be naturally wary of a line that doesn’t include Batman, the book by which all sales are literally measured. On Wednesday, I’ll tackle what is known about Secret Wars, and how Marvel could potentially structure it to get the biggest bang for their buck. Until then, please comment with your thoughts below. I’m contemplating running this as a three parter, ending with your input on Friday, but that’s really up to you folks. From a lapsed DC reader’s perspective this looks exactly like what you caution against. At first I was intrigued by the prospect of getting to spend some time with some characters who’ve been relegated to the dust bin or versions of characters that seem likely to never be used again. However, the linkage or story ramifications to books I don’t follow is troubling. Like you say, it makes this 2 month experiment that much easier to not engage with. Also the talent committed to this isn’t all that compelling. I’ve slowly eliminated DC from my reading list due to some of the talent they have. Scott Lobdell and Dan Jurgens are not going to get it done for me. And without knowing anything about Jeff King, there is very little here to send me off searching for Jeff King’s resume/past works. All of this and what amounts to an 89-issue commitment if these 2-parters don’t end up being self-contained. It’s a lot to ask for such little design toward attracting me as a reader. But perhaps this is just for those who already have strong brand loyalty. In which case, I wish them the best. What I don’t get is why do they need two months to move and put their books on hiatus??? What other compnany in the real world does this sort of thing??? Chris, DC isn’t simply moving to a new office. Half* of the staff are going to be new employees who don’t really even know how to do their jobs yet or even who most of their co-workers are, and the other half* are going to be people moving to a new city across the country with their families, not knowing how to find the supply closet, the nearest bar with lunch hours, the grocery store, or even their house without a map. It’s gonna be kinda disorienting and disruptive, and DC should be given credit for recognizing that and giving their people – half* of which are making (and asking of their families) substantial personal sacrifices for the sake of the company’s rather callous decision to move – a bit of slack. So to answer your question: it’s a company that’s actually engaged with the real world. *Loosely. I don’t know what the percentage is. DC management probably isn’t sure of the exact number yet either. I suppose another difference here is that DC isn’t producing the exact same thing every month. A company that makes widgets can go two months without upper management having to do anything drastic because they can just keep making the same identical widgets they make all the time. DC is making a new product every month.